From picking to packing and depalletizing to stretch wrapping, robots can perform repetitive work that is hard on the human body. Using a wide variety of end effectors and programmed learning modules, robots can 'see' where to place things, know how far apart to space them and precisely stack product to the correct count, all without taking a break or breaking a sweat. Robotic palletizing allows you to move your work force into more valuable work zones and reduce the risk of injury from repetitive motion at the same time. A very cost effective way to increase production capabilities without hiring more manpower. 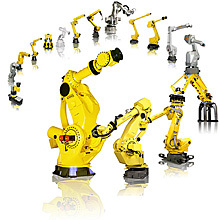 Retrieve product from storage, pick and pack with one robot performing multiple activities. Through automating these processes, you save money and man hours spent in doing repetitive motions and steps going from place to place. Automated case packing puts your production line on high speed with robotics programmed to load cases in one reach. Aligning cans, boxes, and parts, the robot then picks all up at once to be placed in the case.